We characterise 20 microsatellite loci identified from the endangered Carnaby’s Black-cockatoo (Calyptorhynchus latirostris). The primers were tested across 40 individuals from the southwest of Western Australia and displayed between 4 and 11 alleles per locus with expected heterozygosities ranging from 53 to 87% and exclusion probabilities of ≥0.999. 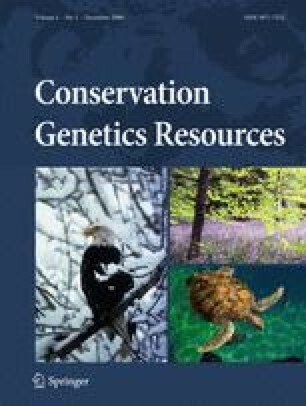 These loci will be useful in population genetic studies to facilitate conservation management decisions in addition to wildlife enforcement applications for the endangered Carnaby’s Black-cockatoo. We also tested the markers in 12 high profile and smuggled species from five genera, Cacatua, Callocephalon, Calyptorhynchus, Nymphicus and Probosciger. These species detected between 2 and 19 alleles per locus with 50–100% amplification success. This work was supported by funding from the Robert Hammond Research Scholarship (to NW), Murdoch University, Department of Environment and Conservation, Department of the Environment, Water, Heritage and the Arts and Birds Australia. The authors with to thank Joannah Lee, Perth Zoo, Western Australian Museum, Black-cockatoo Rehabilitation Centre, Western Australian State Agricultural Biotechnology Centre (particularly Francis Brigg) and George Wildlife Park for samples and technical assistance.